These are University of Utah psychologists David Strayer and Frank Drews in a driving simulator used to show how cellular telephones and text messaging impair drivers. Strayer and National Public Radio's Car Talk show have teamed up to launch a Driver Distraction Center at the show's web site cartalk.com/distraction The center features a blog by Strayer about the dangers of distracted driving. Credit: University of Utah. 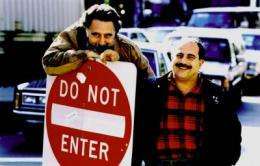 NPR's Car Talk guys, Tom and Ray Magliozzi, may be a couple of motor mouths, but they always put a lid on using cell phones behind the wheel. The perennial jokesters confirm their serious commitment to addressing the issue of devices that take a driver's focus off the road by teaming with the University of Utah to launch the Driver Distraction Center at their web site: cartalk.com/distraction . The center, sponsored by Allstate, offers information and resources dedicated to raising awareness about the dangers of driving under the influence of technology. Though Tom and Ray have been speaking out about distracted driving for years, National Safety Council research indicates that cell phone use and texting while driving cause at least 28 percent of all traffic accidents - around 1.6 million accidents each year. This startling statistic moved the brothers to redouble their efforts and partner with the University of Utah Applied Cognition Laboratory to produce the online Driver Distraction Center. The site's centerpiece is a blog by noted University of Utah cognitive researcher David Strayer, a psychology professor whose expertise has also been tapped by The Oprah Winfrey Show and findings cited by the New York Times and PBS's NewsHour. Other features include Tom and Ray's tips for responsible driving, a driving simulator, a quiz, and informational resources such as the links to reports, a listing of driving laws by state, facts on pending legislation and personal testimonies. "When you're trying to merge onto the highway between a moving tractor trailer and a FedEx truck, your brain is performing a complex mathematical calculation," says Tom. "I think most people know that they can't do that and have an intelligent conversation at the same time. And we have proof of this, because every one of us has had a near miss with a jerk holding a cell phone up to his ear." "And sometimes, that jerk is US!" says Ray. "The evidence is becoming clearer and clearer, and that's what this site is all about." "I've been a fan of Car Talk for years," says David Strayer. "Having studied driver distraction for the past decade, I was excited to collaborate with Tom and Ray to get people to think twice before multi-tasking behind the wheel." "My only stipulation was that I'd talk about the science behind driver distraction and leave the comedy to Tom and Ray and the rest of the Car Talk gang," he adds. Strayer is known for his pioneering research on the dangers of driving while distracted. 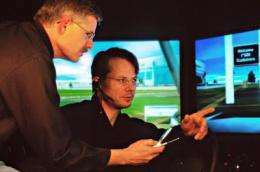 A decade ago, Strayer, University of Utah psychologist Frank Drews and their colleagues demonstrated that talking on a hands-free cellular phone while driving was just as distracting as using a hand-held cell phone due to a phenomenon known as "inattention blindness." In subsequent studies, they demonstrated that when young adult motorists talk on cell phones, their reaction times are as slow as elderly motorists; when motorists talk on cell phones, they are as impaired as people just above the blood-alcohol limit for drunken driving; and that cell phone users impede traffic while driving and talking. In a more recent study, they found that text-messaging while driving sharply increases the risk of a collision.